Anne is a licensed clinical social worker with more than thirty five years of experience in behavioral health, social services, child welfare, and managed care. She holds a master’s degree in social work from Columbia University and a post graduate certificate in human services management from Boston University. She has spent equal time throughout her career in provider agencies and managed care settings. Most of her work in the provider community has been in providing and managing outpatient behavioral health services. Anne spent twelve years as the Vice President of Network Management and Recovery Initiatives at The Massachusetts Behavioral Health Partnership (MBHP) where she was involved in the development of groundbreaking behavioral health services and health care reform initiatives. In her role at MBHP, Anne collaborated with Advocates around our emergency and outpatient mental health services. 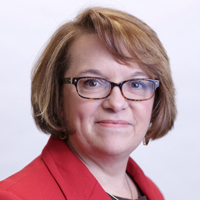 Anne joined Advocates in 2014 as the Senior Vice President of Health Systems Integration and leads Advocates’ efforts to play a significant role in the emerging health care system. This includes designing care management programs and partnering with primary care providers so individuals can access the best possible medical and behavioral health care in integrated settings. Anne collaborated with the Chief Executive Officers/Executive Directors of Advocates, South Middlesex Opportunity Council (SMOC), Spectrum Health Systems, and Wayside Youth & Family Support Network to develop the Behavioral Health Partners of MetroWest and has served as its first Executive Director since 2017.